Download Grandfather – Brush Script font for free. Grandfather – Brush Script is a font / typeface offered for free. please note that if the license offered here is non-commercial you have to obtain a commercial use license / permit from the original author. 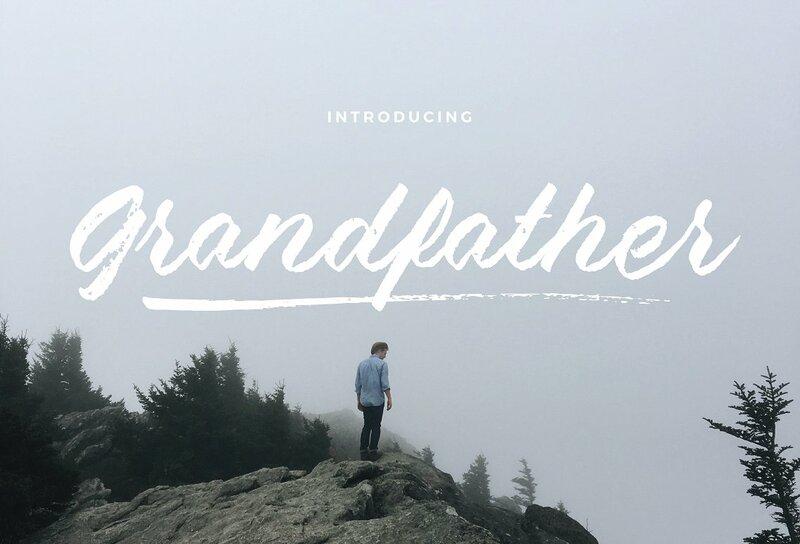 Grandfather is a handwritten brush script font. It takes inspiration from Grandfather Mountain in North Carolina. (it’s also named after it!) Featuring a somewhat bouncy baseline and flowy connections, it gives your designs a truly handcrafted feel. Perfect for use in branding, packaging, headers, print, web etc. Grandfather features uppercase and lowercase alternates, swashes, paint splatters, and ligatures. It also includes multilingual support, please ask if run into issues or have questions. Mountain – Everything that comes with Grandfather. All uppercase, lowercase, swashes, paint splatters, ligatures, and alternates. If you would rather just type in the alternates or swashes you can select them from the drop-down menu. Swashes – These are perfect for adding a quick stroke or slatter to your design. Type any letter, upper or lowercase to quickly add some flare! It’s best used in something with OpenType features like Photoshop or Illustrator. If the Grandfather – Brush Script font is offered under 'commercial use free' or 'creative common' license, feel free to use Grandfather – Brush Script font for any purpose.